Recipe and more after the jump! Math lessons? Charts? But I thought this was a cookbook! Yeah…this is so much more than a cookbook. Do not skip the “introduction.” It is the best part of the book. These first 65 or so pages are dedicated to teaching you the science of putting food in your belly while in motion, a topic after my own heart. First Lim asks, “Do You Really Need to Eat That?” a question I ask myself often when eyeballing the gel section at my LRS. He talks about what’s in the stuff we’re told to shove in our faces during races and how it behaves as it travels through our digestive system. If you’re a middle school biology teacher some of this stuff might be old hat, but for me it was a great reminder of how my body absorbs food, and I especially appreciated re-learning it in the context of eating during exercise. There’s so much more here though. There’s an intensive discussion of hydration and whether drinking your calories is appropriate. What is the right ratio of carbohydrates to water for optimal absorption (Hint: it’s not the ratio that’s in Gatorade)? If we need salt and water, why can’t we just put salt in the water? Why do granola bars I make from scratch feel more nutritious than a granola bar I buy? Why can’t I eat sport-“food” all the time? What is that magic “it” factor that homemade food has that we aren’t getting from the prepackaged stuff? The answers are all within. This book is good. One really lovely and unexpected delight is a detailed photographic instruction on how Biju and Allen wrap their portables. This way you can enjoy not just the flavor of their recipes, but also the form and function that they’ve developed through years of trial and error in the field. It’s also visually appealing, and it’s way easier than it looks! Okay, so what about the food? Is it hard to make? No! There is so much “OH DUH!” happening in this book. Remember, they wrote it from their experience with male pro cyclists, meaning that every recipe is what I call “bachelor approved.” You can make it in a teeny apartment kitchen with zero cooking expertise and basic tools. In fact, they even include a list of the tools in their kitchen so you can check if there’s something you might need that you don’t already have! What about when I’m traveling for a race? DUDE. There are recipes you can make in a hotel microwave! Seriously! In fact, they have a whole “take and make” section. I have never wanted a rolled sandwich before, but now I want one just because it sounds like a smarter way to eat bread and cheese together. Do the recipes contain lots of expensive ingredients? No! One of the awesomest things about this book is that, using the recipes as examples, you can extrapolate them to include things you probably already have around the house. Got rice? I had rice. It wasn’t the kind of sticky rice they recommend, but I used my brain and instead of scrambling eggs and adding to sticky rice, I combined their recipe for rice cakes and baked eggs. I poured the raw, beaten eggs over the rice in the pan and baked it for 20 minutes. It was delicious. What if I can’t eat gluten/am Vegan/love meat/have other dietary restrictions? If you’re gluten free like Cilantro, our resident Celiac runner, or if you’re Vegan like Pepper or if you have other dietary needs, this book will still work for you. There’s a quick guide at the top of each section that has little “V” and “G” markers next to each recipe to denote Vegan or gluten-free. There is a way to make most, if not all, recipes without gluten or to modify for Vegan diets. For you meat-heads there’s tons of that too, and like all recipes, you can always add prosciutto wherever necessary. This is pretty cool: there is a huge “oh duh” gluten pie crust trick in this book. In fact, it translates to a huge “oh duh” pie crust trick in general, which they call their “quick crust.” The pies might be the most bachelor friendly recipes in the book, in fact. There’s a cookies and cakes section? And pancakes? Really? Do I actually have to sell you on that? These are awesome more-nutritious-and-lower-sugar-than-the-regular-kind hacks. Feed your kids Chef Biju’s snickerdoodles and beet juice waffles or pancakes and they’ll beg you for more. If they don’t eat them, just wrap them in your cute little portables wrapper and take them on the run! Okay! I wanted to make the Blueberry & Chocolate Coconut rice cakes (drool), but strawberries were on sale and blueberries were oddly expensive, so I modified this from a couple of different rice cake recipes. I call the flavor “strawberry shortcake,” because that’s what they taste like. Yum! Cook the rice as directed on the package in a pan or rice cooker, adding the salt to the water. When it’s done, squeeze in the lemon juice and stir in the sugar a little at a time. The rice should be just barely sweet. I didn’t have raw sugar, so I used brown sugar. It was good but a little too heavy, which is why I recommend raw. In a separate bowl, toss your strawberry slices in the yogurt. It’s gonna look like pink goo. Add a kiss of honey for extra sweetness and hold. Spread out 1 1/2 cups of your sweet rice into a 9×9 pan or dish, and make it nice n’ even. Then spread out your strawberry yogurt on top. Deeee-lish. If you’re using honey, drizzle it evenly over the yogurt layer, or you can have already mixed it into the yogurt. Spread out the rest of the rice on top. Let it sit and hang out a while…like…I don’t know, long enough to clean up after yourself. No baking. Your cooking is done. No recipe is complete without a photo that looks like zombie guts. The objective is neat, even layers. If you have a tiny kitchen like mine, you might use up all of your space on this project. But the bonus is that the rice cakes will firm up by the time you’re done with dishes. Cut into 12 pieces. They will be a little goopy, it’s true, and your first one out might fall apart into mush. That’s okay, this one is for taste-testing! This particular test went well. The rest, you can wrap in squares of foil – do not skip this step! It helps make the rice cakes more dense and thus more sturdy. I used Chef Biju’s cool foil trick to wrap mine, label them and make them look rad. 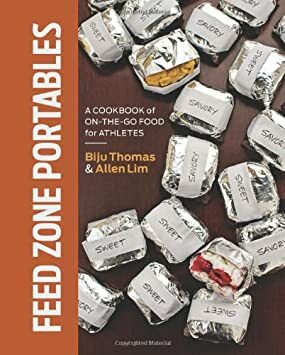 If you read Feed Zone Portables, you can learn it too! Ooh, and here’s an extra tip from me: they fit perfectly in a bread pan, which I used to keep them all in one place in the refrigerator. And the real test… They fit in a SPI Belt! They fit in the zipper pocket of my shorts! In fact, they fit in all but the smallest of running-short key pockets. I tried them out on the run and they were easy to eat, and my friends agreed they are delicious and easy on the tummy. And I also learned that portable rice cakes, cookies and little griddle cakes are the most awesome things to throw in your purse when you’re running out the door with no time to make a meal. They’re at least ten times as delicious as a store bought granola bar! Enjoy! Go forth and eat real food! If you purchase on Amazon by clicking through this image, a teeny portion of your purchase will benefit Salty Running operations – YAY! I like the idea of making my own portable food. I usually rely on bars and gels. I have the other Feed Zone book, so I know that the quality of their books is really good! A lot of photos, which I like in a recipe book. I need this book!!! If it came with someone to cook the recipes for me, that would be even better, but it sounds like I could probably handle the cooking part. Thanks for the great review. Thank you! I’ve been meaning to read this book for ages and you’ve totally convinced me. The Husband is training for his first IronMan and it will be perfect! Off to amazon now! I am so curious about this book now! I’ve always bonked in marathons despite whatever gel strategy I’ve used and need to figure out a better “real food” option, I think. So glad to hear the recipes actually taste good, too. I could totally make a foil pack for it! In fact, if I gift it to someone that’s exactly how I shall wrap it!